America’s middle class is under assault. And as our country becomes more diverse, our racial wealth gap means it’s also becoming poorer. Since 1983, national median wealth has declined by 20 percent, falling from $73,000 to $64,000 in 2013. And U.S. homeownership has been in a steady decline since 2005. While we often hear about the struggles of the white working class, a driving force behind this trend is an accelerating decline in black and Latino household wealth. Over those three decades, the wealth of median black and Latino households decreased by 75 percent and 50 percent, respectively, while median white household wealth actually rose a little. As of 2013, median whites had $116,800 in wealth — compared to just $2,000 for Latinos and $1,700 for blacks. This wealth decline is a threat to the viability of the American middle class and the nation’s overall economic health. Families with more wealth can cover emergencies without going into debt and take advantage of economic opportunity, such as buying a home, saving for college, or starting a business. We looked at the growing racial wealth gap in a new report for the Institute for Policy Studies and Prosperity Now. 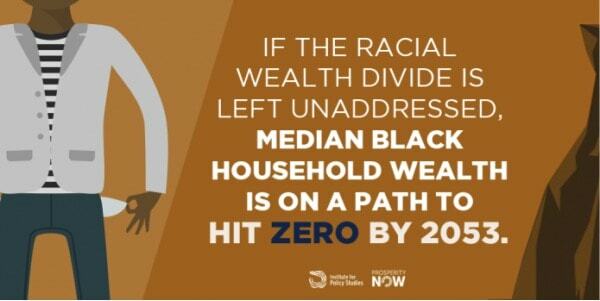 We found that if these appalling trends continue, median black household wealth will hit zero by 2053, even while median white wealth continues to climb. Latino net worth will hit zero two decades later, according to our projections. It’s in everyone’s interest to reverse these trends. Growing racial wealth inequality is bringing down median American middle class wealth, and with it shrinking the middle class — especially as Americans of color make up an increasing share of the U.S. population. The causes of this racial wealth divide have little to do with individual behavior. Instead, they’re the result of a range of systemic factors and policies. These include past discriminatory housing policies that continue to fuel an enormous racial divide in homeownership rates, as well as an “upside down” tax system that helps the wealthiest households get wealthier while providing the lowest income families with almost nothing. The American middle class was created by government policy, investment, and the hard work of its citizenry. Today Americans are working as hard as ever, but government policy is failing to invest in a sustainable and growing middle class. To do better, Congress must redirect subsidies to the already wealthy and invest in opportunities for poorer families to save and build wealth. For example, people can currently write off part of their mortgage interest payments on their taxes. But this only benefits you if you already own a home — an opportunity long denied to millions of black and Latino families — and benefits you even more if you own an expensive home. It helps the already rich, at the expense of the poor. Congress should reform that deduction and other tax expenditures to focus on those excluded from opportunity, not the already have-a-lots. Other actions include protecting families from the wealth stripping practices common in many low-income communities, like “contract for deed” scams that can leave renters homeless even after they’ve fronted money for expensive repairs to their homes. That means strengthening institutions like the Consumer Financial Protection Bureau. The nation has experienced 30 years of middle class decline. If we don’t want this to be a permanent trend, then government must respond with the boldness and ingenuity that expanded the middle class after World War Two — but this time with a racially inclusive frame to reflect our 21st century population. Dedrick Asante-Muhammad directs the Racial Wealth Divide Project at Prosperity Now. Chuck Collins directs the Program on Inequality at the Institute for Policy Studies and co-edits Inequality.org. They’re co-authors of the new report, The Road to Zero Wealth.